We are very happy to announce that Hanna Taylor was featured yet again on the Marc & Mandy show providing expert advice on home lighting features and how to beautify your home with lighting art. In the interview Hanna took us through a custom-built home where Hotwire Electric designed and installed all lighting. It is an art that upgrades the quality and pleases the aesthetic of home. Having a best lighting features that is suitable to that place makes it more noticeable and prominent. Hotwire Electric has always come up with the interesting ideas to lighten up the homes with featured lights that describes that area more prominently. Some wonderful lighting features that are discussed by Hanna Taylor are Skylights, LED lighting, Chandeliers operated by lift to make maintenance more easy, Recessed lighting and Accent lighting’s. At hotwire we always take care of the area plan, furniture’s dimensions and pre plan our lighting accordingly. If some areas or things need highlights, we use accent lighting fixtures to highlight its architectural design and features. We also take care of our client’s mood and design our lighting with color changing effects that adjusts brightness to create calming or serene mood. The lighting scheme you choose can either elevate the décor and charm of your home or it can just fall apart the whole architectural beauty of your home. So, it is really necessary to have experts like Hotwire Electric’s electricians in your plan who can help you build art of renaissance with lighting. Call us today to have your custom home’s electrical and lighting designed by Hotwire Electric! Hotwire Electric was again featured on the Marc and Mandy show and this time it’s about Indoor Lighting. The Marc and Mandy show had asked Hanna to explain more about the new trend in lighting. In this video Hanna Taylor, CEO of Hotwire Electric explains about accent lighting and lift installation. Accent lighting can add extra style and elegance to your home. Accent Lights are used not only in staircase but can be used in many other places in your home. These lights can be used in your kitchen, above cabinet lighting, inside cabinets, living rooms, closet etc. It’s important to do accent lighting in the right way. Hotwire Electric is an expert in custom lighting and is the right choice for your home. Have you ever wondered how to change bulb or clean a chandelier which is hung from a tall ceiling? Previously if you had to replace a bulb or if you had to clean a chandelier you had to use ladder and get the chandelier down to fix it or clean it. However, with new technologies in place we don’t have to worry about getting the chandelier down. Add the new features to your home and make it fully automated by contacting Hotwire Electric. If you want to convert your home with the new smart features, Hotwire Electric is the best place for you. Our company provides the best service for your home with latest technology. Using this automation technology you can make your life comfortable. If you are looking for an electrical contractor in the GTA you must call us first and get a quote. We are one of the best companies to change the entire look of your home. Call us today on 416-553-5533 to get a free estimate. Hotwire Electric is excited to announce that we are featured on the Marc and Mandy show again and that our CEO Hanna Taylor was invited to answer few questions about lighting ideas. 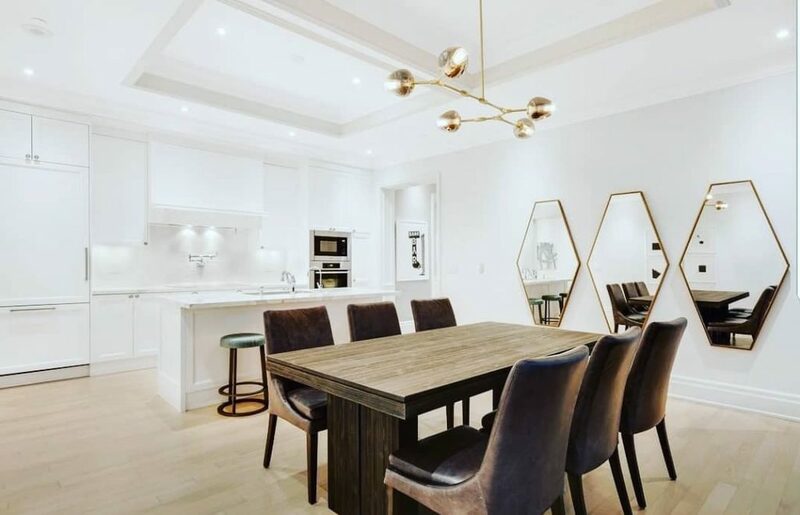 Hotwire has been serving clients for over 10 years and when it comes to home lighting, Hotwire Electric is voted as #1 electrical contracting company in Toronto. Lighting is an essential part when it comes to upgrading your home. Placing the light in the correct spot is very important. With the size of the room you need to determine which kind of lighting will be suitable for the room and Hotwire Electric will take care of every minute detail in your home. Having the best lighting features accentuates your home. With this new technology we can get to know what is happening in our house and keep track of everything. At Hotwire Electric we endeavor to give clients the best and the most essential equipment in their homes. Question: I’m debating whether or not to install Home automation. What sort of things can be automated? Dan Lastoria from Hotwire Electric also states that “You will also be able to keep update on whose actually coming to your doorstep through your phone even if you are not at home”. Hannah says that “Security and alarm features are all integrated with our automation system here”. If you want to convert your home with the new smart features, Hotwire Electric is the best place for you. Our company provides the best service for your home with latest technology. Using this automation technology you can make your life comfortable. We can rest assure that we will be the best electrical contracting company you can hire. We at Hotwire Electric will help you plan your home to a better place with smart technology. Call us today on 416-553-5533 to get a free estimate. We are delighted to announce that our very own Hanna Taylor, the CEO of Hotwire Electric was featured again on the Marc and Mandy show. The Marc and Mandy show had asked Hanna to help the viewer’s learn and understand the benefits of electrical panel upgrade. As mentioned earlier, if you have an old system it may not be able to support your modern home, more appliances, more electronics and more lights. With growing technology we use a lot of electrical appliances and the amount of electricity supplied in our homes may not be supported by the older types of panel. Your modern home requires a better electric circuit. Old homes probably have fewer outlets. Upgrading your electrical panel will allow you to have more outlets with an increased amount of electricity supplied in your home. When you are looking to upgrade your electrical panel, Hannah mentions that there are 2 different options for home owners. Standard set up or updating the panel means that we are replacing the older fuse panel to a newer panel which gives you a breaker system or more circuits. Updating the entire system which usually is like updating the utility from 100 amps to 200 amps by going from the meter base on the outside of the house inside the home into your panel and instead of just having a 100 amps of power you are now upgrading to 200 amps of server so not only you getting a larger size panel but you’re actually providing your house with more ampage for uses. So you can add a pool, a hot tub you can increase what devices are now being driven by that panel inside your home. To learn more about the benefits of electrical panel upgrade and to determine if you can upgrade your home with a new electrical panel you can contact Hotwire Electric today on 416-553-5533. Talk to one of the experienced, knowledgeable residential electricians at Hotwire Electric to get a quote today.